It isn't enough that his uncle was Joey Dunlop. Yes, THE Joey Dunlop. The man who won a whopping 26 races at the Isle of Man Tourist Trophy. The very same man who was as well known for his racing prowess on track, as he was for his philanthropy off track, often driving around Serbia and Romania, distributing food to people affected by the war that ravaged their nations. Other than the pressure of being Joey Dunlop's nephew, Michael Dunlop also carries with him the burden of a 'family' name in road racing, with his father Robert also having won races at the Isle of Man five times. While his older brother William is also a regular at the TT now, it does appear that the collective hopes of Irish motor racing fans ride solely on Michael Dunlop's pudgy shoulders. And as it so happens, the 24-year old is determined to deliver. Let's rewind to 2008. 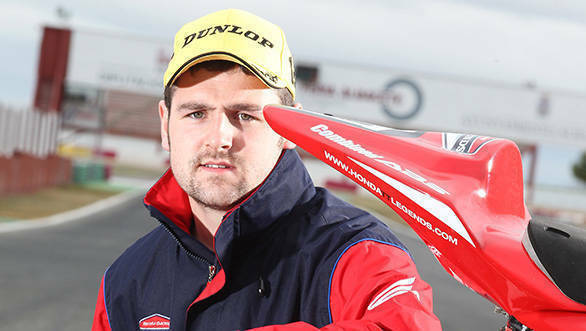 The younger Dunlop's first ever win at the North West 200 ought to have been a moment of great pride and celebration. But, it wasn't. He had lost his father Robert Dunlop at that very event barely 36 hours before the race, and so the scene on the podium was far from the usual post-victory revelry. Dunlop, however, had been determined to race and win in his father's memory. The victory, then, was a fitting tribute to a fallen hero. For Michael, it was just the beginning. Other than working at the garage that his father once owned and trying hard to make sure the family made ends meet, he was, above all else, determined to win at the TT. And his determination paid off. Just one year after that painful win in 2008, his name was penciled into the record books alongside that of his late uncle (Dunlop died in Tallinn, Estonia while leading a 125cc race) and father, when he won the Supersport TT astride a Yamaha. His 2010 season of racing might have been forgettable, but things got better in 2011 when he won the Superstock TT, with a win in the Supersport TT the following year. It would appear that everything was leading up to 2013, then. The expectations of the rider bearing the Dunlop name were high, the fans were out in full force at the Isle of Man. And the pressure, most certainly, was on. 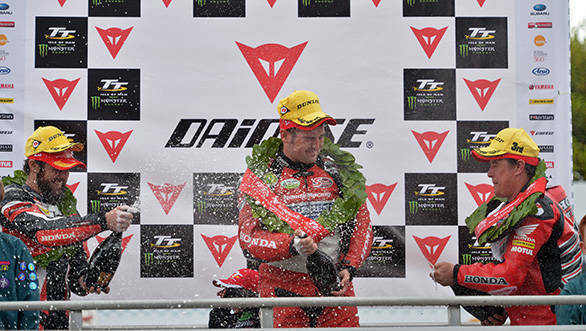 When the first race of 2013 kicked off at the TT, it was an emotional one, weighed down with memories aplenty. You see, it was the 30th anniversary of Joey Dunlop's first win for the Honda TT legends team. As an homage to that fact, living legend John McGuinness donned leathers of the same colour as Dunlop, complete with his characteristic yellow helmet and took to the track. McGuinness, however, would have to settle for third step on the podium, one place behind Cameron Donald. The top step of the podium in the Superbike TT would go to Michael Dunlop - once again a fitting tribute to the Dunlop name. When it was time for the Supersport races, Dunlop was unstoppable. Once he got past Bruce Anstey, there was no real challenge thrown the way of the Ulsterman. Dunlop kept increasing his lead over the chasing pack, making it increasingly obvious that there was simply nothing that could come between him and the chequered flag. Anstey held on for second, while Michael's brother William took third place. The Superstock TT races were next on his radar. When the race started, however, it was Gary Johnson who took the lead. But the thought of giving up didn't once cross the mind of young Michael. What he did do was chase Johnson to the very end of the race, getting past him on the final lap, setting a new lap record of 131.671mph (212kph) along the way. From doing the double, to taking a hattrick, then. It seems like Dunlop's not done though. Because, just as we were sitting down to write this piece on how he'd managed to blaze his way to three wins at the legendary TT races, he's gone one better. Michael Dunlop won his fourth race of four starts at this year's TT, when he claimed victory at the second Supersport race too. Way back in 1996, Phillip McCallen won four TT races in one week, a feat that Michael has managed to equal. When he starts his fifth race tomorrow, winning will be his goal. And if he does achieve that goal, he will have equalled Ian Hutchinson's 2010 record of five wins in a week. It certainly would appear that the youngest Dunlop is coming to terms with the family name.